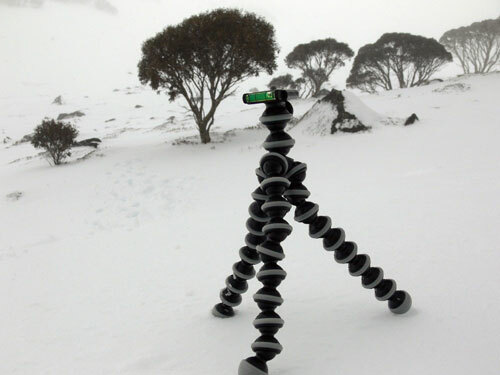 I recently had the opportunity to try out the Joby “Gorillapod SLR” flexible tripod while on holidays in Australia’s Snowy Mountains and found it to be very useful and surprisingly popular with other people in my ski lodge who were fascinated by it’s ultra flexible bendy leg joints. 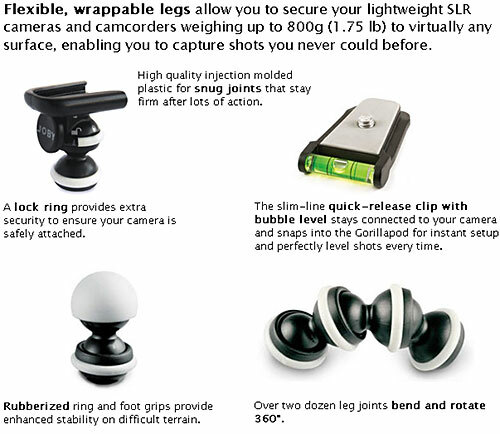 I had chatted with a representative from Joby at the recent PMA Australia 2009 Imaging Technology Show and asked if I could get a review unit of their “Gorillapod” flexible tripod which I’d seen other photographers using to take creative photos in situations where a traditional tripod would be useless. They sent me a “Gorillapod SLR” suitable for use with my Panasonic FZ30 ultrazoom camera as well as a Gorillapod SLR-Zoom for bigger bulkier SLR cameras which I gave to my friend Wolfcat to test with his Nikon D90 (see his review My new constant companion… Mr Joby Gorilla Pod SLR-Zoom). I already own a normal collapsible camera tripod but rarely use it because its heavy, takes up lots of space and often isn’t appropriate for places I take photos in the great outdoors or urban areas without stable footing. In comparison the Gorillapod SLR is rugged enough to just throw in your backpack without worrying if it will get damaged, can withstand snowy, cold or hot conditions with no problems and has their brilliant flexible ball and socket jointed legs which enable you to take photos on completely unstable surfaces or wrap around tree branches, balcony railings, street signs etc. The Joby Gorillapod SLR is available in Australia for prices from $50 (on sale at time of writing at Teds Cameras) to the more common price of $65 at Digital Camera Warehouse. It is an awesome gadget – has been selling like crazy over here in Germany, too. Next PostNext What The Hell Is Naked ADSL?